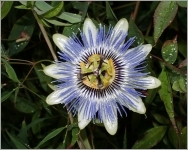 Passiflora caerulea, or the Blue Passion Flower is typically grown in tropical gardens or greenhouses for the exotic beauty of its flowers. Blue Passion Flower is native to Southern Brazil and Argentina. Wild range extends throughout Central and South America and as far North as the Southern United States. Extremely fast growing vine that may grow up to 30 feet tall. It grows on fences or trellises, or allow it to scramble over shrubs and trees. It an be kept as an container plant. It may be grown as a houseplant in a sunny South-facing window. Passiflora caerulea flowers from Summer through Autumn. Flowers are ornate, multi-colored, with a minty scent. 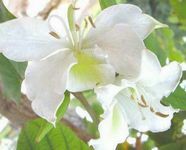 This evergreen or semi-evergreen climber produces beautiful white and purple-blue flowers, they may be as large as 4 inches across. In warmer climates without much frost, the vine will grow and bloom throughout the year. This Passion Flower is producing egg shaped orange fruits with deep red edible pulp. They aren't very tasty raw, but they have a vaguely blackberry-like flavor. The shiny green leaves are usually palmately lobed with five parts, but they can have as few as three lobes or as many as nine. They are evergreen in Tropical climates, but deciduous where Winters are cool. Pruning is a must to keep the vine healthy. Prune off less vigorous growth and occasionally prune back vigorous growth to promote flowering. When established, and without care, the passion fruit can easily overtake other garden plants, shading them from sun.